London's streets are set to get safer for cyclists with the news that on bike cyclist awareness training has been approved as part of an HGV driver's Certificate of Professional Competence (CPC), and that in some cases such training will be backed by Transport for London (TfL) funding. "HGV drivers who've cycled on the roads as part of the training tell us they become more aware of more vulnerable road users, which can help prevent injury and death to cyclists. Six London boroughs have already given their drivers on-bike cyclist awareness training, up until now the stumbling block for others wishing to do so was funding, because such training was not CPC approved it had to be undertaken as an extra on top of CPC training with extra budget having to be allocated. CPC approval means that it can be included in CPC training without the need for extra money, the boroughs simply have to choose to include it. London boroughs that are part of the Biking Boroughs scheme and those that are members of TfL's Freight Operator Recognition Scheme, which is practically all of them, will now be eligible to send drivers working for them on TfL subsidised training courses. Making sure they do will be the next focus of the LCC's No More Lethal Lorries campaign says the LCC's Lloyd. The world of professional driver training provision and it's funding is an arcane one, but essentially the change means that on-bike cyclist awareness training has been accepted as part of the curriculum of core skills that can be taught to drivers as part of their CPC training, and that a training provider, in this case TfL has had a course that includes on-bike training approved. Councils and their contractors account for only a small number of the lorries moving in, around and through London every day. The really big win for campaigns will be getting private lorry operators to include on-bike cyclist awareness training as part of their CPC training – which bits of the CPC approved curriculum a company chooses for its drivers to be trained on is up to them, that isn't compulsory, having the annual training is. 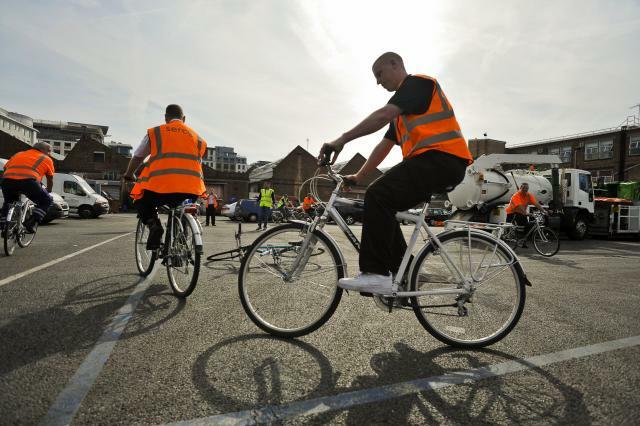 Barking and Dagenham which has one of the capital's highest concentration of transport and haulage firm within its boundaries has already started promoting the benefits of on-bike awareness training to the companies in its area. Although the change to CPC driver training has been driven by the situation in London, now that such training has been approved there is nothing to stop other training providers and haulage companies in other parts of the UK coming up with similar schemes for which CPC approval should now be a formality.